Here's how the next winner of our Blog & Vlog contest, Steven Heisenberg, sees the future of payments with crypto. Sounds good, doesn't it? Thank you for your awesome drawings, Steven?—?the 2nd prize in the Blog Contest is rightfully yours! Hi, my name is Steve and I am a Crypto enthusiast based in Florida, one of the US States which has been severely impacted by the housing bubble. Apparently, many areas of economics were globally affected by the 2007–08 financial crisis. There were many factors for that and all of them were systematic. It has begun when the Federal Reserve created a flood of liquidity in the economy by lowering the interest rates and making cheap money available. It encouraged mortgage lending which meant more real-estate buyers coming and home prices skyrocketing. Such an environment paved the way for complicated financial instruments and excessive risk-taking by banks with their subsequent collapse and a solvency crisis for financial institutions. The financial crisis played a significant role in the failure of many businesses, and even my family was affected. In 2008, my father had to file for bankruptcy for his small business due to the crisis consequences. These events and wrong decisions threw discredit upon the current financial system and regular currencies. Ironically, shortly after the events, the first and currently most valuable decentralized protocol was released by anonymous Satoshi Nakamoto. It was the dawn of the whole Crypto industry. The introduction of the new type of currency which is not controlled by any government was a huge step forward. But unfortunately, Crypto is not so far widely accepted in the real life. To catch on the Crypto industry, it takes intermediary infrastructure solutions which will become a bridge between Crypto and Fiat economics. Many projects are targeted on providing crypto-to-fiat payment solutions but only several are still on the market. I would like to focus on one of them. Crypterium is building a processing engine for all kinds of crypto-to-fiat transactions and unlike other Crypto payment solutions, which sometimes take long time to process a transaction or needs to be prepaid in fiat, operations within Crypterium mobile app will be instantly fulfilled. Recently, the team has successfully tested first crypto-to-fiat transactions and will release this functionality throughout the world soon. I can't wait to make my very first ordinary purchase via Crypto. It would be a hot dog purchased right in front of the Federal Reserve Building, the most Crypto adverse place in the world I can imagine. It would be my astoundingly amazing protest against the current monetary system! It would be the tastiest hot dog I've ever tried in the new world, the world where people are in control of their funds. Crypterium operates on unique utility token (CRPT) used as a transactional fuel. Each transaction forms a constant demand on tokens, because the small commission goes to purchase them on the market with their subsequent burning. Eventually, the commission is in the hands of token holders, who benefit from CRPT decreasing circulating supply. 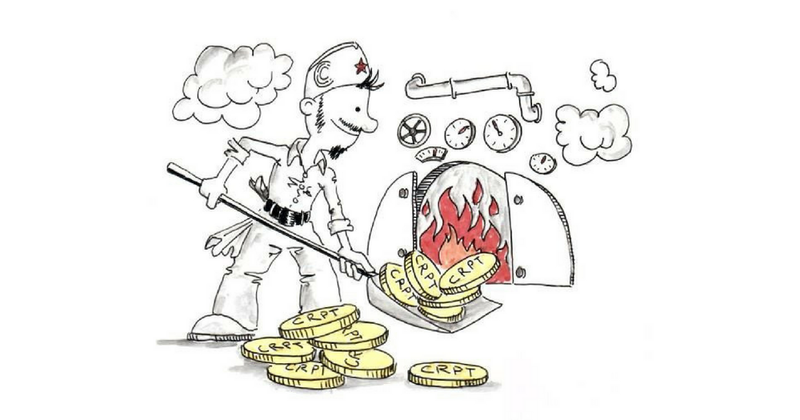 Furthermore, CRPT tokens bestow on its holders' special product benefits including increased rewards depending on user activity. The commission and exchange rates have crucial importance for payment systems. The specially designed technology called Crypterium SX (Smart Exchange) ensures the best rate for users available on the market at the moment of transaction and enables instant crypto-to-fiat operations. What really distinguishes the project from the competitors is the strategic vision. The team considers the integration with Visa/Mastercard infrastructure as the first step to stimulate mass adoption of the service. And newly appointed CEO who is former CEO of Visa UK has the relevant extensive experience and knows how to do that. The next step as the adoption grows is to develop its own payment infrastructure. QR contactless payments is one of the most growing trends in payments worldwide. Crypterium is going to develop a universal solution that has the ability to replace expensive and restricted functionality of the POS terminals, or can be simply used as an alternative to those terminals where the merchant has no access to them or would prefer an enhanced experience. So, even a babushka in the Russian countryside will be allowed to receive payments via Crypterium. It's a huge and big breakthrough to entering cashless society and connecting people that still stay out of banking services. Let's summarize the factors which will drive CRPT price and why it has an unlimited growth potential. So, I have the CRPT in my portfolio and try to buy it for the bottom price because it will pay off hugely. By the way, it seems that Crypterium sounds like a crypt. I like how the team ambitiously comments that Crypterium will become both crypt and mortuary for traditional banks. Being one of the largest ICO by the number of token holders, Crypterium is still capable of reaching a much bigger audience. Taking care of the non-savvy in Crypto people! Operating globally, working on local user experience to better understand the customer needs, because the needs could vary by region and country. Taking that into account, Crypterium is going to become the real changer of the game rules. Best wishes to the team! Stay true and committed to your great goals! Looking forward to Crypterium's growth and mass adoption. Disclaimer: The information above is neither legal nor financial advice and presented for informational purposes only. Before considering any investment, make sure you take time to do your own thorough analysis and as with any form of highly speculative financial instrument, you shouldn't invest more in Crypto than can afford to lose.